Last weekend our research group along with some others went on a short field trip that was a cross-section of the California convergent margin. We were principally looking at the Mesozoic system — the continental arc plutons of the Sierra Nevada, the sedimentary rocks of the adjacent forearc basin (Great Valley Group), and then the deformed cherts, pillow lavas, and greenstones of the Franciscan subduction complex. Normally, the forearc and accretionary prism do not get well preserved, but thanks to the transition from a subduction margin to a strike-slip margin (San Andreas Fault system), these major elements of the Mesozoic system are preserved in their general relative positions for us to examine. Although we focused on the Mesozoic system, we looked at many of the younger features along this transect as well. This week’s photo is of Sutter Buttes, or sometimes known as Marysville Buttes. This hills are sticking out of the middle of the fantastically flat Central Valley like a giant zit on a teenager’s forehead. 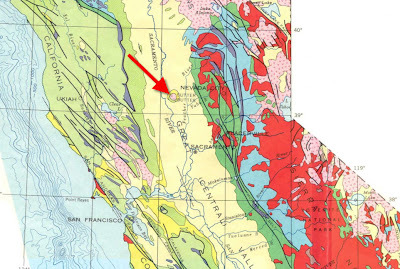 Below is a very general geologic map of this part of California pointing out the location of Sutter Buttes. So, what are these hills all about? They consist of rhyolites and andesites that were erupted about 1.5 million years ago. This young and small volcanic complex appears to be part of the Cascade system. Mt. Lassen, which is ~100 miles to the north of Sutter Buttes, is the southernmost volcano of the Cascade arc to have erupted in historical times. There is some debate about the position of Sutter Buttes with respect to the northward migrating triple junction and associated timing of cessation of volcanism. Some of these questions remain unanswered. If you ever find yourself in the Great Valley and are feeling topographically-deficient, go check out the Buttes. Is that where the pyrite mountain is located? no, i don’t think so…but we didn’t actually go up to the mountains…Thermochronic might know, he’s a former Great Valleyan. I’ve never heard of Pyrite Mountain myself, I’ll have to check it out. It should be noted though that checking out the Sutter Buttes is kind of a pain because they are all privately owned, and you have to get landowner permission to spend much time on them. Threre are some places where roadcuts expose the volcanic units, but public exposure is rare. Oh, and right nearby is some of the best birdwatching in California, a series of wildlife refuges right in the Pacific migratory track of many different species.